“Take this,” he said. I refused. The roof over my office where I write is being replaced. I’ve noted this word “office” before. Office suggests a place where serious business is conducted. There is little I conduct, serious or otherwise, in this space, and such a laden and infused word feels at odds with the spirit of the place. The building is old, like much of the Old Port, and even five flights up my space has a fireplace and a bold heavy mantle. The fireplace is no longer functional and I doubt it ever was. Who would carry wood up all those stairs? Atop the mantle I keep trinkets from travels. I have a Buddha from Thailand, another one from Tibet, still another one from India, and a beautiful silver Bodhisattva from Bhutan. A room cannot have too many Buddhas. I also have a cast-bronze dragon, long and lean, that I picked up in a market in China. It’s mouth is open and the tongue appears as fire. 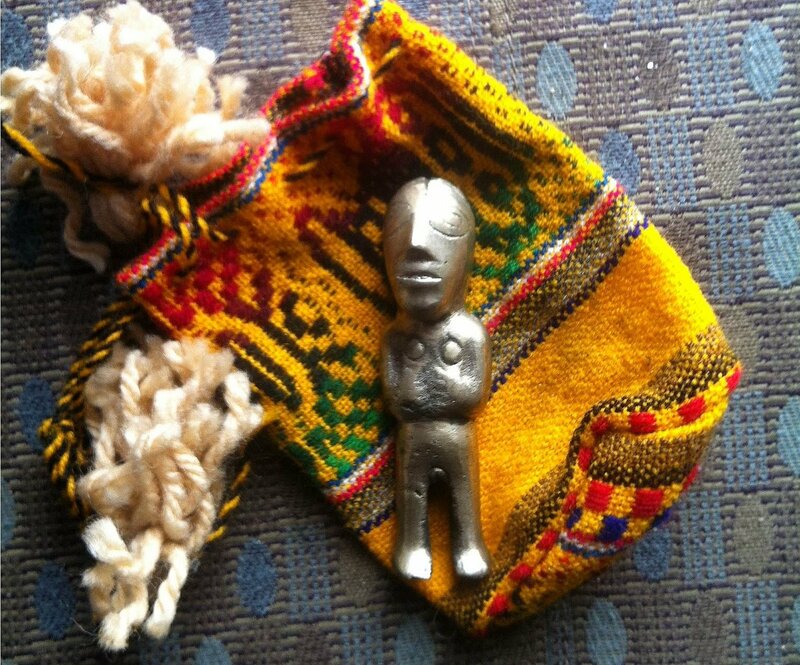 I just now realize that a fist-size piece of amber I bought in a village in Ecuador is missing. It had a wasp suspended in it, Jurassic Park kind of stuff. I must have lost it in a move. Most unusual is a lead doll. It stands about two inches tall and rests surprisingly heavy in the hand. I was having a restless night in Cusco, Peru, and decided to walk into town. It was dark and the square at the Cathedral of Santo Domingo was empty and I was sitting alone and enjoying the coolness when a man approached me. He was holding a small pouch which he handed to me. “Take this,” he said. I refused. “Please,” he asked. I told him I was just getting some air, that I didn’t have any money. “It doesn’t matter,” he said. “I came to give you this.” His English was good and he was nicely dressed. He opened the pouch and removed the doll. She is silver and naked and quite beautiful. The man disappeared into the mist. The doll rests in a place of honor on the mantel. Someday I hope to understand what happened that night. On an opposing wall I have a little shrine, for lack of a better word, to my once-companion, Maggie. I have a couple of pictures of her and her collar. She was often a subject of these pages. Next to her, I’ve pinned a photo of my friend Michael, also now gone. There are other things in the space that I cherish, many of which I’ve attached to the walls with thumbtacks. There are my stamped entry papers to the Annapurna National Sanctuary in Nepal, as well as a thick strand of yak hair my guide, Ram, gave me. He knew I was concerned about a mountain flight scheduled for the next day. The previous day’s plane had slammed into a cliff, killing all but three. The yak hair was to protect me. It did. I have several photographs hung as well, most of them remaining inventory from the gallery I once owned. Beware of gifts from strangers was my first reaction. Once, over ten years ago, in a bar, I had a stranger hand me a C.D., In a fit of paranoia I said “I don’t want your (expletive) C.D.” grabbed it and threw it in the trash, I ran off alone. Maybe the stranger was just promoting a band or something, I guess I’ll never know. It is odd, isn’t it, the gut reaction to a thing out of the ordinary? I suspect our initial urge to not trust such a thing has a long-term evolutionary backstory–which makes it all the more magical when the we are pleasantly surprised. Thanks for your story. Beware of strangers with a mix CD! Thanks for sharing , such an interesting story. The universe planned for you to have this doll and the man at the square was appointed to deliver. Thanks, Becki. It seems that when you put yourself out there a little bit, you’re either rewarded or punished. This was a reward.